It doesn't take very much to see why Princess Diana has been earning more time in the spotlight lately. There's always been an uncanny fascination around the royal family, and with the press following Meghan and Harry's every move post-wedding, it's reached a fever pitch. Our curiosity extends even further to every other member of the royal family, past and present. It's the reason nostalgic photos of Princess Diana outfits keeps popping up all over Instagram. The Princess of Wales was a style icon of her generation, and while her outfits will always be celebrated, the particular silhouettes she was wearing back then have never been more relevant than they are today. Thanks to the revival of all things '80s fashion, Lady Di's wardrobe seems to have predicted a number of 2019 trends that, were she around today, she'd surely be wearing. From her version of the perfect party dress to the denim trend she predicted decades ago, keep reading to see how Princess Diana wore 2019's biggest trends first and better. Between the velvet and the ruching details, this little black dress is '80s perfection and arguably one of her most iconic looks to date. Thanks greatly in part to Princess Diana herself, '80s silhouettes like this one are at the height of party trends right now. This dress wants you to know that more is definitely more. This delightful crystal and velvet pick is a fashion-girl favorite. The bustier-inspired neckline is so chic. 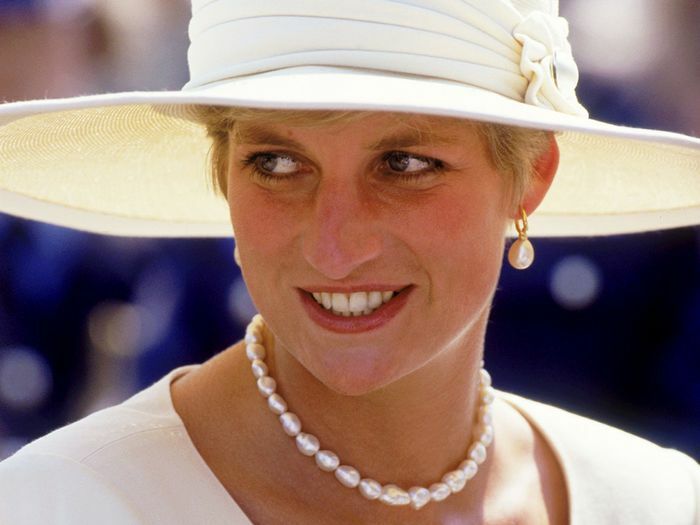 It just so happens that Instagram's prettiest jewelry trend was a Princess Diana favorite. Whether adorned on drop earrings or strung on a choker necklace, baroque pearls are the one trend that's proving to be as timely as it is timeless. Just think of how stylish this would look layered over thin knit tops. The varied pearl sizes ensure this one doesn't appear in the least bit dated. Light-wash jeans are the denim trend that seems to rotate in and out of style every few seasons. News flash: They're on the come up once again, and Princess Diana found the chicest way to style them with a crisp white button-down and leather accessories. If you find yourself shying away from the polarizing wash, let Lady Di's ensemble serve as all the inspo you need. This straight fit won't be going out of style anytime soon (or ever). The key is to style the jeans with neutral earth tones like brown and beige. Fashion girls will all be wearing light wash jeans in equally-trendy upsized fits like this. On a visit to a British army regiment, the Princess of Wales joined in on the military exercises via an army-green boilersuit. Little did she know then that the utility-inspired look would become a major 2019 trend. We can't decide what we're more into, the green color or the oversize pockets. Name a celebrity who hasn't worn this exact jumpsuit—we'll wait. A word to the wise: Snap up this affordable piece before it inevitably sells out. Princess Diana is basically a modern-day athleisure icon at this point. She was constantly spotted heading to and from the gym in an array of pastel-colored bike shorts, the trend the fashion world can't stop buzzing about in 2019. She usually styled them with oversize sweatshirts, crew socks, and chunky-soled sneakers—a combo we've probably all worn with the trendy shorts. These aren't solely meant for trips to the gym. Dress them up with an oversize blazer and chunky Dad sneakers to ace the look. Because black bike shorts are so last year. Saturday afternoon called and it wants you to try this laid-back look.